British Crop circle aficionados were worried that tight restrictions on access to farmlands would put a crimp in this year's crop-circle production. But art is evidently more powerful that foot-and-mouth disease. So far, 78 crop circles have appeared in the UK, including a dazzling fractal-type design, discovered on 13 August, described as "jaw-dropping" by John Lundberg, author of the Circlemakers Bulletin. 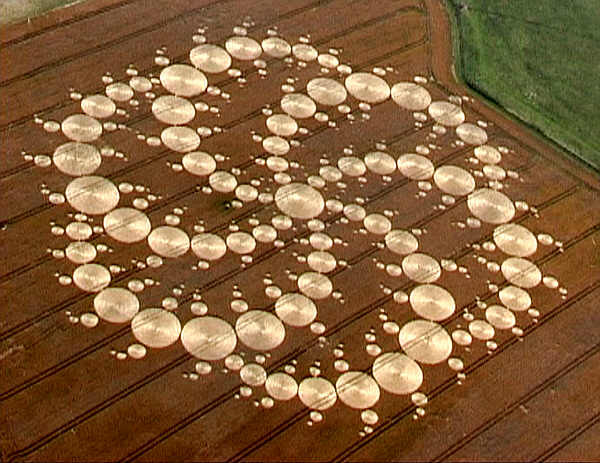 Appearing in Wiltshire in southern England, the heart of crop-circle country, it comprises 409 circles in a spiral pattern more than 450 meters across"dwarfing the 60-meter average diameter of this year's designs. Lundberg says that the "sheer scale and complexity" of this opus has many people baffled. He estimates that for it to have been done in hours of darkness, the makers had to create circles at a rate of one every 30 seconds"with no time for preliminary survey work. "I know from previous experience," he says, "that after a certain length (about 60 meters) it's very difficult to hold a tape measure above the crop without it sagging."